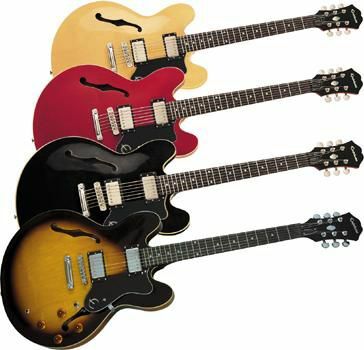 The ES semi-hollow body guitars from Gibson first appeared in 1958. The Epiphone Dot Electric Guitar looks and feels a lot like a vastly more expensive Gibson ES-335. The Dot features a laminated maple body, a glued-in mahogany neck, and a dot-inlaid fretboard. Its ’57 Classic pick-ups have alnico magnets and and a 3-way pickup selector for growling snarls and sweet, singing sustain. Features 2 volume and 2 tone controls that let you tailor your tones to fit your style. The flawless finish, the stop tailpiece and bonnet knobs gave an authentic touches. This guitar is offering a sound only a hollow body can deliver. If you like to play jazz, blues, gospel, rock, this guitar is great for both beginners and professional players. The Epiphone Dot Electric Guitar is made for anyone who wants to spend less for an absolutely stunning guitar! 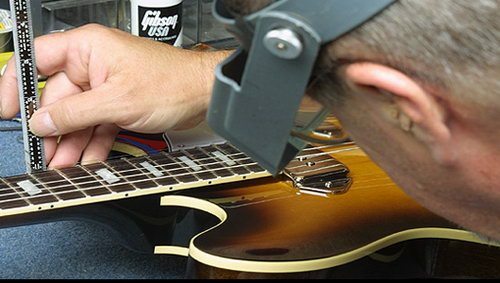 End of Epiphone Dot Electric Guitar Reviews :: Electric Guitar Reviews.